"The Cubs promotion doesn't stop with the card giveaway. It's accented by 200 autographed cards that are mixed in with the standard cards. The Cubs also plan to have each player appear on their TV and radio broadcasts and sing "Take Me Out to the Ballgame" during the seventh-inning stretch. The Cubs paid each player about $5,000 to sign the cards and make the appearance, an industry source said. They also secured the rights to the images of retired players, a hurdle for Topps because its licensing agreement applies only to active players." Thanks Laurens for the clarification! I own a lot of signed Andy Pafko cards, photos, postcards, and other odds-and-ends but a new eBay auction puts a new twist on adding an autograph to a card . I've written about this unique card in the Pafko cannon of cardboard before as it's one of the few numbered Pafko cards and were given out during a Cubs game in 2001. They came sealed in plastic with the Gatorade and Foxsports.net logos on the front. 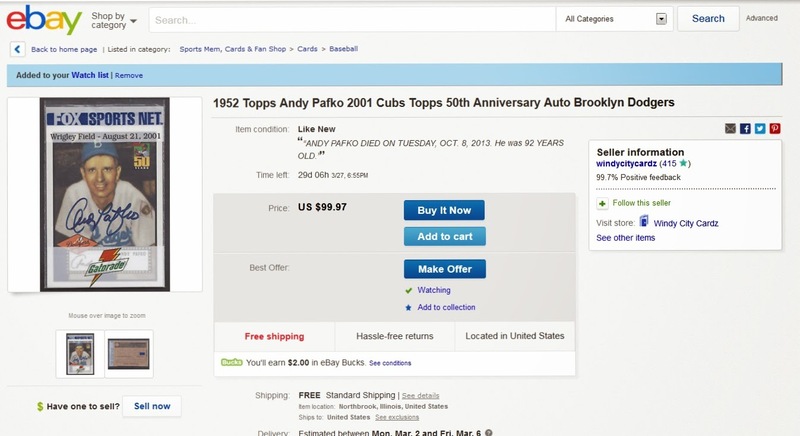 One of these cards from the 30,000 that were processed is up on eBay now with an Andy Pafko autograph on the front. But the item description tells us the card is still in its original packaging and so I can only assume that they had Pafko sign the plastic packaging over the card. I had never considered getting the equivalent of a penny sleeve signed before! Sadly, I have a signed penny sleeve from Ralph Houk. I sent him a TTM request in the late '90s, and sent the card in a sleeve. He never took the card out and signed the sleeve. I haven't sent a card in a sleeve/case for a TTM request since. Lesson learned! Unless you are talking about an actual mistake by Pafko and he signed the wrap, there were cards signed as part of the promotion.